Welcome to the Pendleton Chapter, Military Officers' Association of America. Welcome to the website of the Pendleton Chapter of the Military Officers Association of America (MOAA). This Chapter serves Northern San Diego, Southern Orange, Southern Riverside Counties, and Camp Pendleton, California. The Chapter's principal activities are sponsoring the Armed Forces YMCA, Camp Pendleton, six local JROTC programs to include two scholarships, and, for the past 30 years, the annual MOAA Marine Corps Birthday Ball. The Pendleton Chapter offers local opportunities for camaraderie, job networking, and organized legislative action on local, state, and national levels. To apply for Chapter membership click here. on the second Saturday at 11:00 hours at the Hungry Hunter Restaurant, 1221 Vista Way, Oceanside, California 92054. (Southwest corner of I-5 and Vista Way next to bicycle store.) All members and interested parties are invited to attend. To insure enough food is prepared, please call NLT two days earlier to advise Joe Hallisey, (760) 233-1316 of number attending in your party. Cost of lunch is $12.00 (payable at the door). We publish the Pendleton Officer's Call, a monthly newsletter. The Board of Directors meets on the third Wednesday of the month at 10:00 hours at a place to be announced. All members are invited to attend. Our new Chapter President, CWO2 Angel Aviles, (RET) Served in the US Army with the 2nd Infantry Division (1953-54) at Korea's 38th Parallel. That was followed by 21 years with the US Coast Guard (1955-74) including a 1968 tour at Da Nang with Coast Guard Squadron #1. 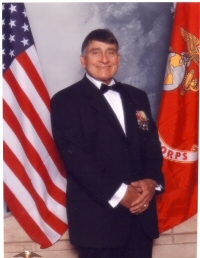 Angel was a Chief Warrant Officer in both the Army and the Coast Guard. He went on to work for the US Customs Service in New York, and as a federal agent with the U.S. Department of the Treasury doing criminal investigations until 1995. He is active in the Federal Law Enforcement Association and the MOAA.